The Giveaway is closed! The winner will be announced Saturday Dec 31! While browsing the gorgeous selection of vintage inspired women's dresses available at Shabby Apple, I fell in love with this stunning Mulholland dress. The lace detailing and adorable bow belt were perfectly ladylike and exactly what I was looking for. I loved this glamorous dress so much that Shabby Apple and I thought it would be nice to give it away to one lucky Miss Melissa reader! 2) Follow Miss Melissa via google friend connect! 3) Leave one comment and let me know that you've done these things! Follow Miss Melissa via blog lovin'. Shabby Apple is also offering a 10% off coupon to Miss Melissa readers. Just enter the code missmelissa10off at checkout! *note* You will be winning this dress but in your size, not the exact one I am wearing :) This giveaway closes at 5pm pst on Friday December 30th! Good luck! PS, the winner of the Barefoot Contessa giveaway is Smelly Danielly! I will be emailing you with details. Congrats! You look absolutely beautiful Melissa!! Love that dress, it is so gorgeous, and love the way you styled it with the clutch, those sparkly earrings and that amazing faux fur jacket...you look so pretty when you smile, so nice to see! I follow your blog and like Shabby Apple on Facebook. Love this dress! It looks amazing on you! I am just starting to get back into wearing dresses and I would love to try this on! me know that you've done these things! i liked shabby apple on fb! also a follower of yours! I follow your blog and Shabby Apple! I follow Shabby Apple on Facebook now and you via GFC & Bloglovin. So excited about this giveaway - fingers crossed! That dress is fabulous! And I looove that coat! That dress is stunning!!!! I liked Shabby Apple on FB and I follow you via GFC. I liked Shabby Apple & Miss Melissa on facebook. My email is agiesbrecht@hotmail.ca. I love this dress and you look stunning in it. Oh yes! I want that dress! Done it all! Done and done. Pretty dress! Please reach me at opalline at gmail dot com. such an elegant dress, it looks sensational on you! You look fantastic in this dress - you should win it! I have to say, you're outfits have been extra amazing the last little while - I've loved everything! I liked Shabby Apple on Facebook. I follow you via Google reader. That dress really suits you. done those things and would love this dress, though i can't see how it could look any more adorable on anyone but you! oh and plus i like you on facebook! Such a gorgeous dress! I like SA on FB already & I'm a follower through GFC! I like them on Facebook "crave to save"
I follow you publicly on GFC "Gina M Maddox"
follow you on blog lovin'! You look beautiful in this dress Melissa! Wonderful choice! I like Shabby Apple on Facebook (as Chelsea Donaldson) and follow you via GFC! And I already follow your blog via Bloglovin'! 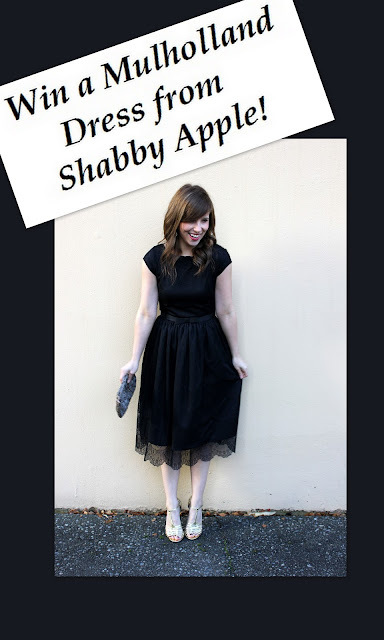 I like Shabby Apple on fb and I definitely follow you on gfc! Great dress, very Blaire Waldorf ;). i like shabby apple on facebook, and follow you on gfc! p.s. i ike you on facebook too! this might be my favorite dress yet!! looks AWESOME on you! love everything about it! i like YOU on facebook!! I love the dress and cool modelling pics! I love the blog and great giveaway! I liked Shabby Apple and I followed Miss Melissa via google friend connect! I like Shabby Apple on Facebook, and I follow you on GFC. I like Shabby Apple on facebook and I follow your blog on GFC. I'm a GFC follower, and I like them on FB! Following you, and like Shabby Apple on facebook! Great outfit - love your lipstick, too! Already LOVE Shabby Apple on Facebook and Lovin your blog already also! Thanks! Like you on Facebook too! Gorgeous dress! Am already following you, have liked SA via Facebook! liked via facebook and became a google follower! became a follower on blog lovin'! I follow your blog and "like" Shabby Apple on Facebook! Aww Melissa, I adore the lace trimmings on the bottom of that dress. You're adorbs. Shabby apple is such a funky brand name, haha. Liked on FB and GFC, great giveaway! I've been following you on GFC for quite some time now and I also liked Shabby Apple of FB. Just gorgeous. I want to make this my goal dress for 2012 :) I did everything you asked and added you on Facebook. I tried to add this blog to my bloglovin' because I love this blog but my mobile wouldn't let me and its my only source for the holidays... hope I win. Love the dress - it looks super cute on you!! Have liked you both on Facebook, added on google friend connect, and spun around three times. I like Shabby Apple on facebook. I follow you on Google Friend Connect. *this one may have been a little too creepy.